There’s no denying that the Greater Toronto Area’s real estate market, both new and resale sectors, has been slow. 2018 was basically a nose dive compared to the high activity in 2016 and 2017. Now, I think we’re seeing signs of the market rebounding after a tumultuous year. Leading into spring, my team had their eye on a few highly anticipated spring openings. One of them was New Kleinburg, which is part of the successful Impressions community. Arista Homes, DECO Homes, Fieldgate Homes, OPUS Homes, and Paradise Developments opened the project last weekend. Our blog posts about New Kleinburg were seeing high traffic in the days leading up to the opening, so I could already tell that there were a lot of people interested. A member of our team attended the grand opening to see what the turnout was like, and it did not disappoint. He told me he couldn’t even park in the parking lot, and there were numerous police officers managing the traffic created by the event. I’ve been to grand openings like this, but not since 2016/2017. Apparently people were “camping” out at the sales centres. People created lists for each builder and had to check in every few hours for attendance! New Home Buyers Network has managed databases and appointment booking modules during busy times like this, and I’m thinking that if this level of demand continues, some builders may want to bring back booking appointments. The appointment booking modules were pretty straightforward. The builder simply decided on time slots and how many groups they wanted per hour, then an email was sent out to registrants who would then secure their appointment time. This avoided campouts and crowding at the sales centre. But you know what? I think it’s kind of a good thing to see a crowd like this in the current state of our market. We’re in a time of transition. People are adjusting to the mortgage stress test a year after its implementation, price growth has stabilized a bit, spring is in the air, the federal budget showed some support for the new home industry and first-time buyers, and the economy is stable. We’re in good shape. 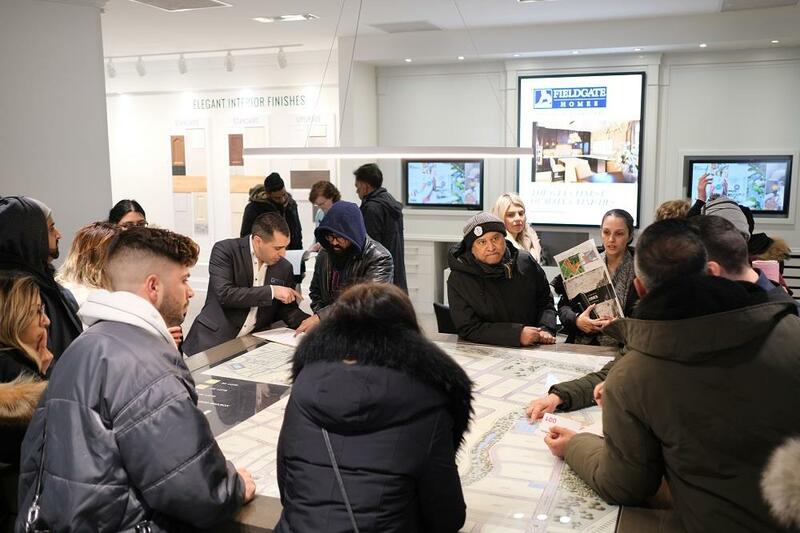 A successful grand opening like the one at New Kleinburg will help build confidence in the market, and is a sign that confidence is building. I get the feeling that there are still some potential buyers on the sidelines taking the wait-and-see approach. Well, I’ll tell you that it doesn’t seem like the mortgage stress test is going anywhere, and if you’re holding out for 30-year mortgages, don’t hold your breath. In February 2019, new single-family home sales spiked by nearly 150% year-over-year. February usually isn’t even a busy time for the new home industry. I’m eager to see the March 2019 numbers when BILD and Altus Group release the sales figures. My guess is that spring - March, April, and May - will be busy. The market is rebounding after a policy-induced slowdown. I can’t wait to see what the rest of April has in store.